Birk was quiet for a long time after dinner. She asked me how to scan a picture that she had drawn. 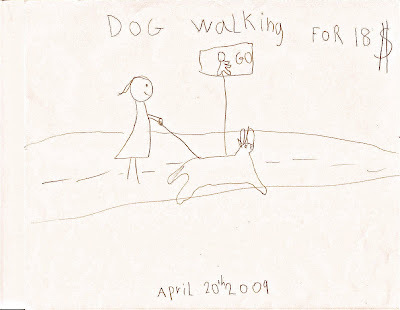 A few minutes later, she handed me a stack of papers advertising dogwalking…for $18.00. She put on her shoes and was ready to go post her flyers around the neighborhood. You’ve got to love kids. John informed her that it would take approximately 66, 667 dogs. You’ve really got to love kids. This entry was written by Mermaid and posted on April 23, 2009 at 6:03 am and filed under Uncategorized with tags funny things kids say, ski house, skiing, Tahoe. Bookmark the permalink. Follow any comments here with the RSS feed for this post. Post a comment or leave a trackback: Trackback URL.